AMD all-rounder. 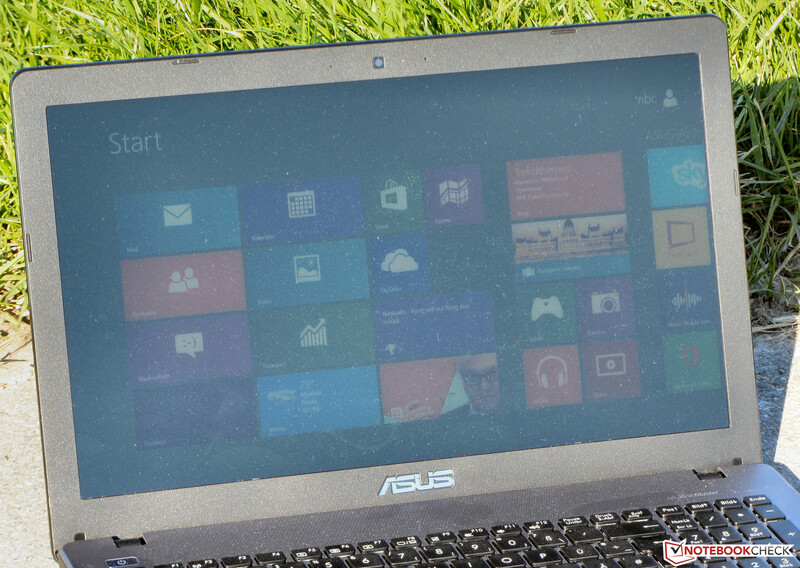 Asus equipped its latest notebook with a quad-core CPU and a dual graphics solution. Thanks to a 1 TB hard drive, the laptop has a big storage capacity. Our review reveals whether the computer is attractive. 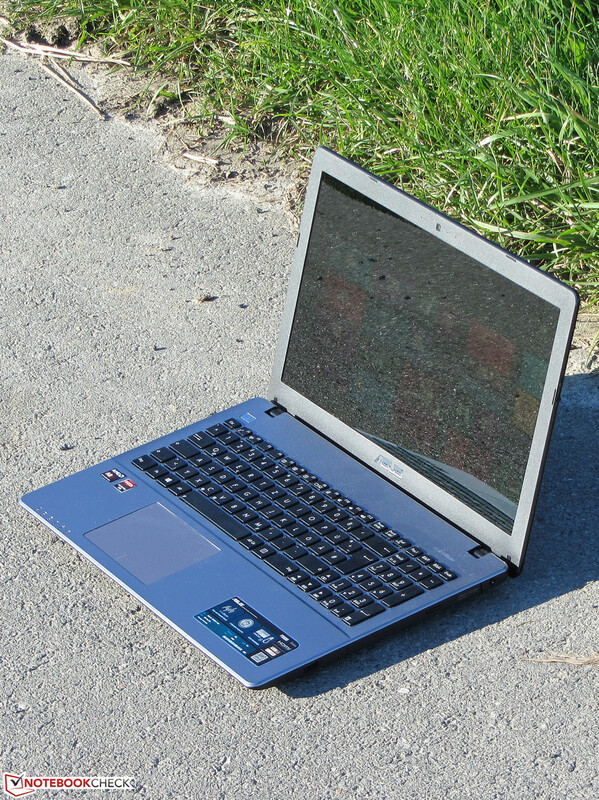 There is no shortage of affordable 15.6-inch multimedia notebooks nowadays. Virtually all manufacturers offer several models. Recently, Asus added a new series. A quad-core CPU and a dual graphics solution - both from AMD - should attract customers. Our review reveals whether this is successful. 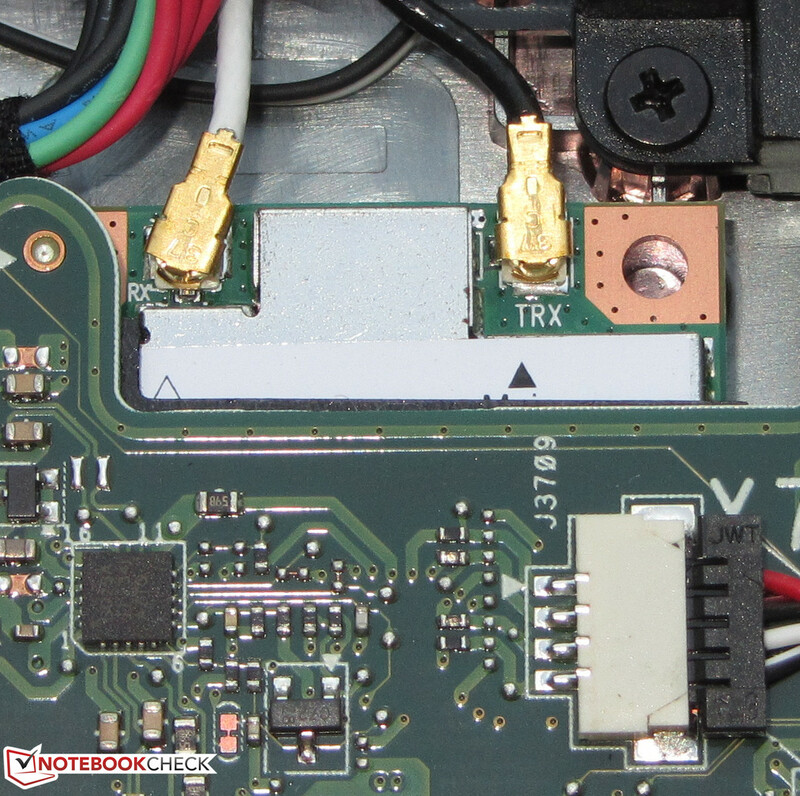 We compare the notebook to Toshiba's Satellite C855-2J4 (Core i5-3230M, Radeon HD 7610M) and Lenovo's G505s (AMD A6-5350M, Radeon HD 8450G + Radeon HD 8570M). The F550DP's and the Asus F550CA-XX078D (Pentium 2117U, HD Graphics (Ivy Bridge)) test model's design are very similar. 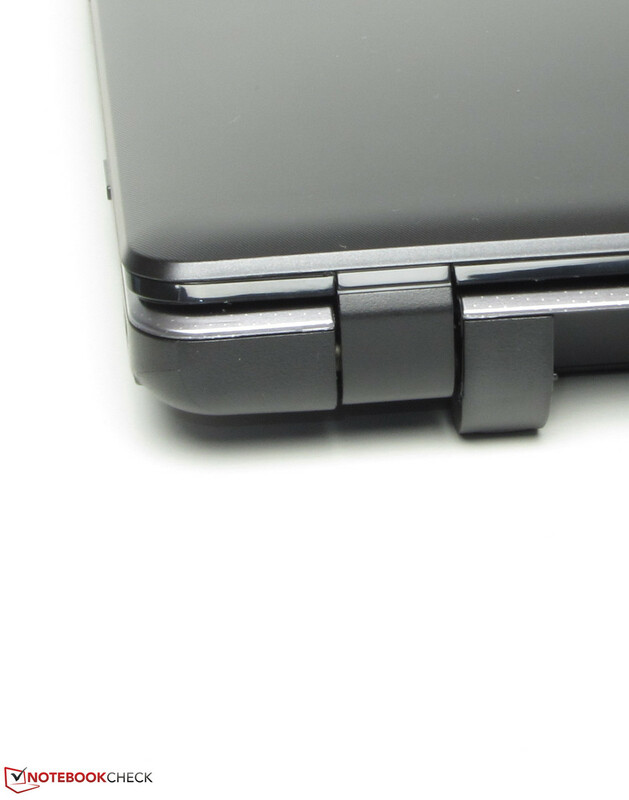 Therefore, we will not cover case, connectivity, input devices, and speakers in-depth here. Look, size, and stability of the F550DP resemble the Intel-based F550CA's. However, there are small differences: The F550DP does not have a maintenance hatch and its battery cannot be easily removed. ...and the F550CA are different. The connectivity of the three competitors is very similar. They feature the interfaces usual nowadays. Each of them has at least one USB 3.0 port. 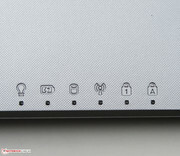 The Lenovo G505s is the only one with Fast Ethernet, while the other two devices come with Gigabit-Ethernet. The F550DP performs slightly better than the F550CA, as it also features a third USB port (USB 3.0). 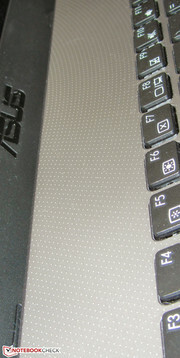 Although the two Asus computers do not have the same interface layout, it is suboptimal anyway, because all interfaces are at the height of the palm rests. The F550DP comes with pre-installed Windows 8 (64-bit), but a Windows DVD is not included. Windows 8 can be replaced by Windows 7 without problems. Windows 7 drivers are available for all components. 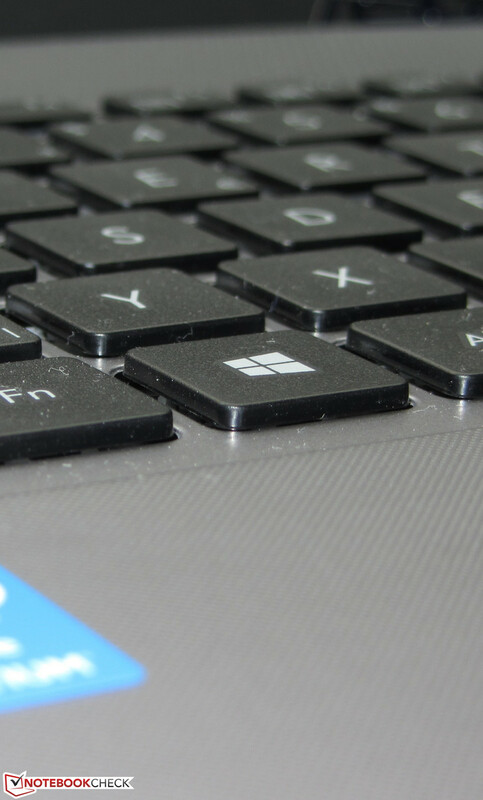 Windows 7 does not include drivers for the APU, the dedicated GPU, the chipset, the Gigabit Ethernet chip, the Wi-Fi module and the USB 3.0 controller. The Wi-Fi module works with Windows 8 drivers from Asus' website. Drivers for the Ethernet chip can be downloaded from Realtek's website. The APU and GPU can be configured with the current Catalyst drivers from AMD's website. In addition, AMD's site provides drivers for chipset and USB 3.0 controller. Unlike the F550CA, the F550DP does not have a maintenance hatch. 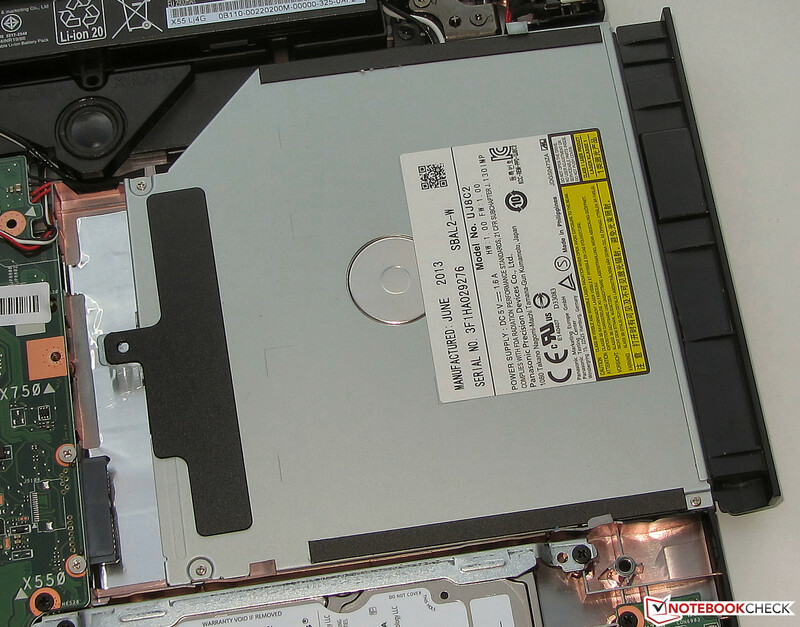 In order to get to the inner components, you have to open the base unit, which is easy: Remove all screws on the underside of the notebook, place the notebook on its feet, carefully loosen the top of the base unit with a spatula and lift it on the front side. 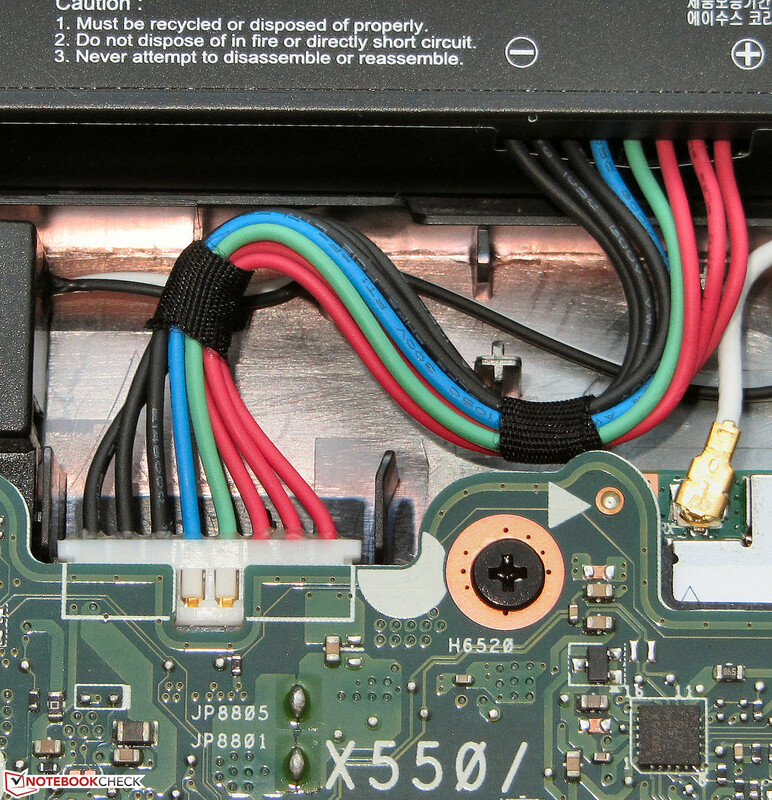 You can simply disconnect the three flat cables connecting the top side to the motherboard. They are long enough to reconnect them without problems. The hardware is accessible now - that is apart from the RAM. You need to remove the motherboard to get to the RAM modules. 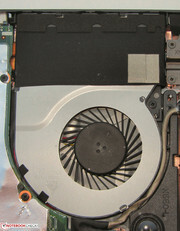 In contrast, it is easy to replace the hard drive. 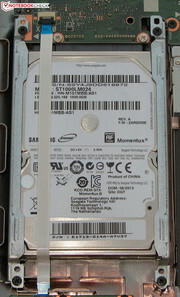 2.5-inch hard drives with 7 or 9.5 mm height fit in. You can even remove the fan for cleaning. 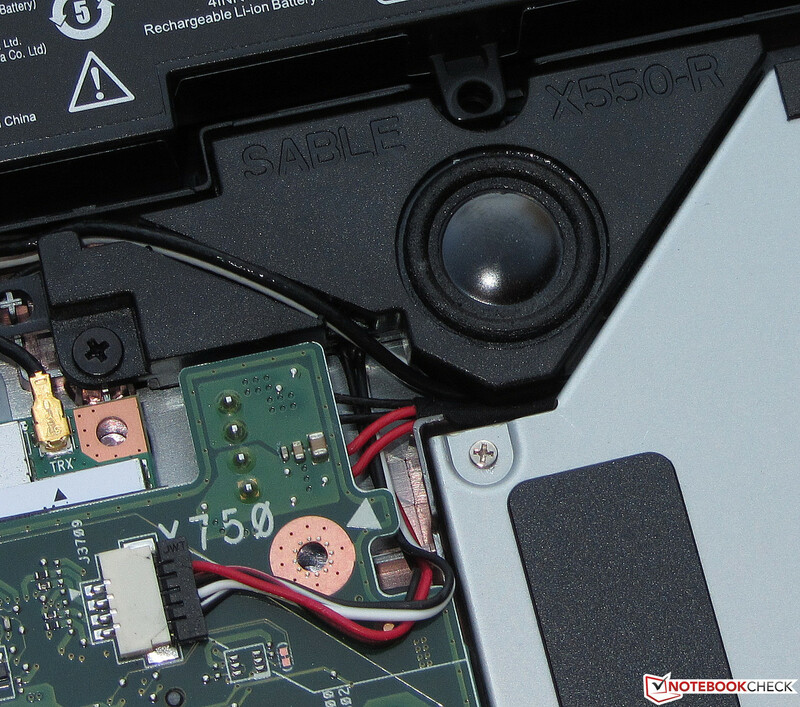 If required, the battery can be replaced. Once the case is open, you can disconnect it without further tools, because it is not screwed in. It is connected to the motherboard via a plug. Asus uses a glossy 15.6-inch display with a native resolution of 1366x768 pixels. The average brightness of 215.2 cd/m² is mid-range. 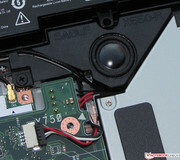 The display of the G505 (212.8 cd/m²) is on par, while the Satellite's (228.7 cd/m²) performs slightly better. The F550DP display's brightness distribution of 78% is not overwhelming. The competitors perform better in this aspect. Contrast (218:1) and black value (1.09 cd/m²) are very poor. Nowadays, even cheap notebooks seldom deliver that low values. The G505s (307:1, 0.75 cd/m²) performs only slightly better, while the Satellite's results (507:1, 0.46 cd/m²) are acceptable. 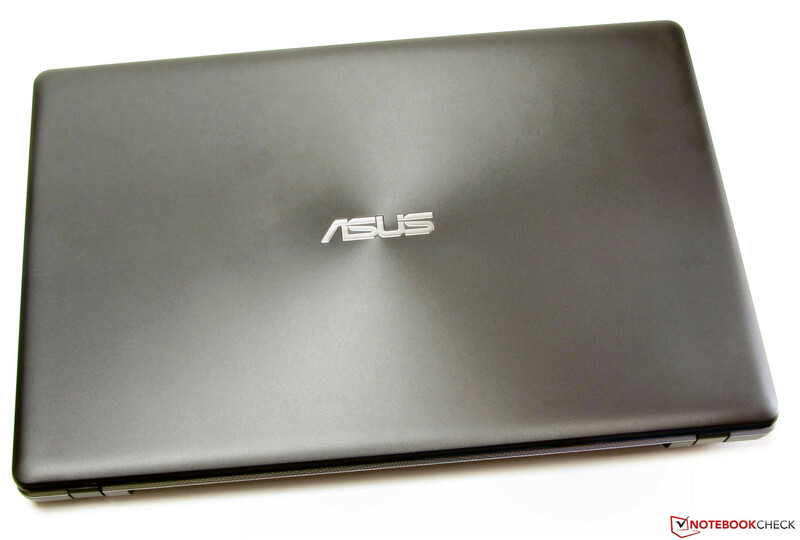 With the F550CA-XX078D (779:1, 0.28 cd/m²), Asus recently proved that even cheap notebooks can deliver high contrasts. 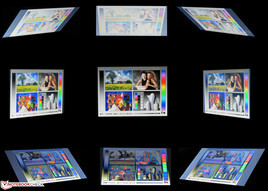 The pictures of the color space comparison show that the Asus can cover neither sRGB nor AdobeRGB, which are important for professional image editing. The colors are surprisingly good ex-factory (target space: sRGB). The average DeltaE 2000 deviation of 3.7 is very low. 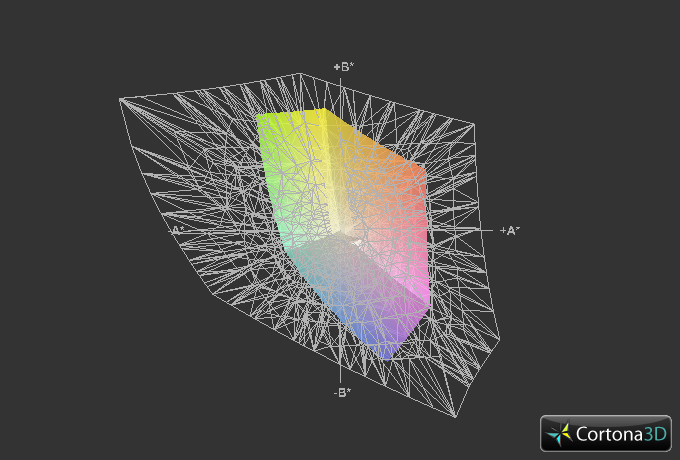 Virtually all colors are within the target range (DeltaE smaller than 5). Only cyan slightly exceeds this level with a DeltaE of 5.083. We appreciate that the display is not bluish. 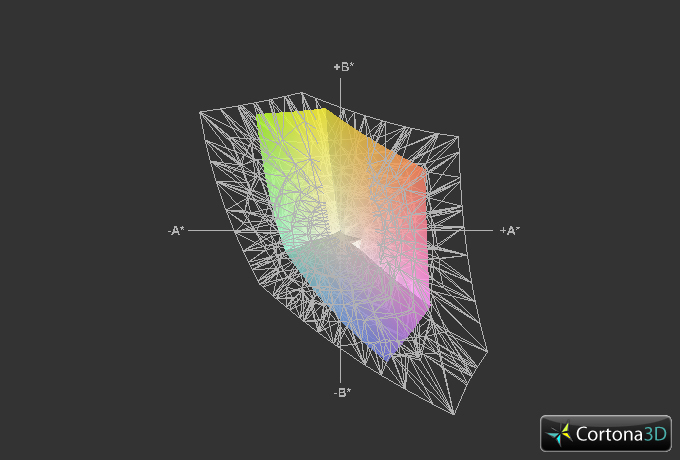 The good values are not surprising: Asus installed a color profile. The display is just legible outdoors. That is, if reflections are avoided. The viewing angles are as expected. Alike most cheap notebooks, they are wider in a horizontal direction than in a vertical direction. The image quickly distorts if the vertical viewing angle is changed. 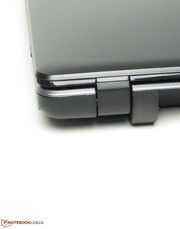 The image remains legible from the sides, but it gets slightly darker. 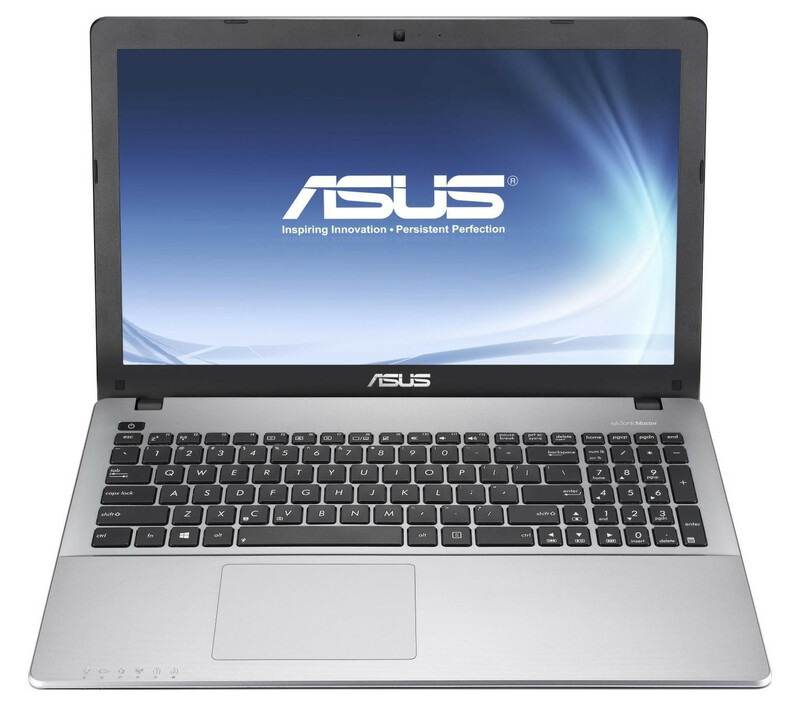 With the F550DP, Asus offers a cheap 15.6-inch multimedia notebook. 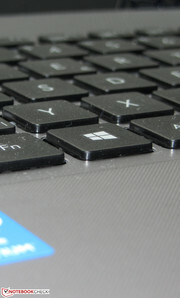 The computer can run modern computer games and less demanding tasks including office applications, internet communication, or video playback do not pose a problem. Our test model is available for about 550 Euros (~$746). If a 500 GB hard drive is sufficient, it only costs just below 500 Euros (~$678). 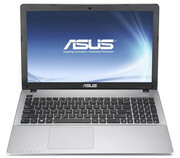 Asus tends to launch cheap models under two names, see e.g. the F55A and the X55A series and the F550CA and the X550CA series. Further variants of the F550DP called X550DP might appear soon. However, we did not yet detect such at the time of testing. Asus equipped the F550DP with an AMD A8-5550M APU based on the Richland architecture. The CPU part of the APU is a quad-core processor with a base clock of 2.1 GHz. The clock rate can be increased to up to 3.1 GHz (AMD Turbo Core). AMD specifies a TDP of 35 Watt for this APU. The CPU clocks at 2.8 GHz during the single-thread tests of the Cinebench benchmarks. Time and again the clock rate of one core increases to 3.1 GHz. 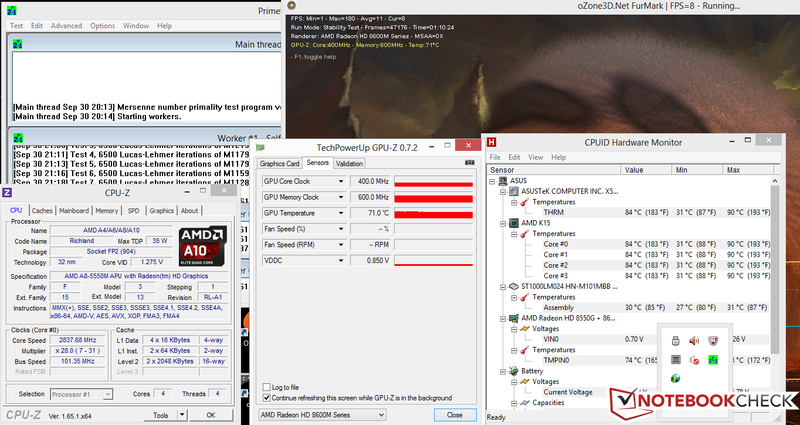 During the multi-threading tests, the CPU usually clocks at 2.4 GHz. However, the clock rate of all four cores frequently falls to 2.1 GHz. As a result, multi-threading applications cannot use the full potential of the CPU. The G505s (AMD A6-5350M, Radeon HD 8450G + Radeon HD 8570M Dual Graphics) can keep up with the F550DP in the single-thread tests. This is not surprising, as the CPU of the G505s has a higher clock rate. Both notebooks are slower than the Satellite (Core i5-3230M, Radeon HD 7610M). The Intel CPU performs significantly better than the AMD counterpart. The Satellite achieves the best results in the GL tests. This is slightly surprising, as a single dedicated Radeon HD 8670M GPU is nominally faster than the Radeon chip of the Satellite. There might be two reasons why the Satellite performs better: The scaling of the dual graphics solution is not perfect and the dedicated GPU of the F550DP only connects to the video memory via a 64-bit interface. The system works very sluggishly. As a result tasks take a long time. If a folder is opened, it takes several seconds until the icons of the files it contains are displayed. We assume that this is a problem with the Windows installation, as the hard drive achieves typical benchmark results. Although we cannot exclude the hard drive, it is not the main suspect. Furthermore, this could be only a peculiarity of our test model. The results of the PCMark benchmarks are not good. The G505s (AMD A6-5350M, Radeon HD 8450G + Radeon HD 8570M) has a slightly faster hard drive than our test model and performs slightly better than the F550DP in PCMark 7. The Satellite (Core i5-3230M, Radeon HD 7610M) is significantly better than the two competitors as it is equipped with the fastest CPU. The direct comparison of the F550DP with the identically equipped HP Pavilion 15-e052sg (AMD A8-5550M, Radeon HD 8550G + Radeon HD 8670M) proves that the hardware platform can indeed perform better. The PCMark 7 result of the Pavilion is 50% higher. We incorporated a Solid State Drive (Crucial RealSSD C300 - 64 GB) in the notebook and installed Windows 8 on it. The F550DP benefits a lot from the SSD and the system works fast and smoothly with it. In addition the PCMark score increased significantly to 2982 points, more than doubling it. 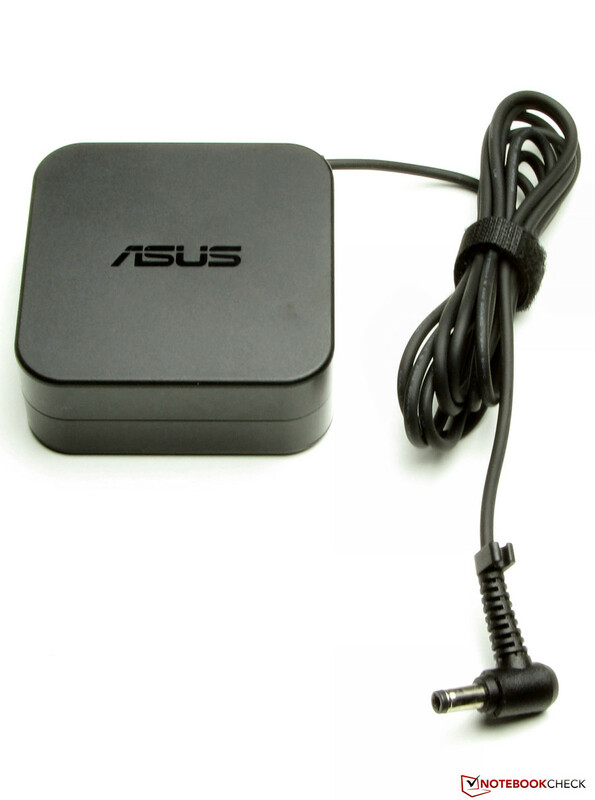 Asus used a Momentus SpinPoint M8-Series from Seagate with a capacity of 1 TB and a revolution speed of 5400 rpm. Typical of Asus, the hard drive has an OS partition (372 GB) and a data partition (537 GB). CrystalDiskMark reports a read rate of 100.1 MB/s. HD Tune displays an average transfer rate of 77 MB/s. These results are appropriate for a 5400 rpm hard drive. The F550DP uses an AMD dual graphics solution consisting of the integrated Radeon HD 8550G graphics core and a dedicated Radeon HD 8670M GPU. Both graphics chips support at least DirectX 11. 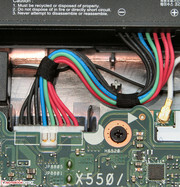 The two GPUs are connected via a Crossfire bridge. So, both cores can calculate images in parallel if needed, e. g. during computer games. If only little graphics performance is demanded, e.g. during DVD playback, only the integrated GPU is used. The same is also true on battery. However, the dual graphics solution could also be used in these scenarios. Whether an application should use the dual graphics solution can be specified in the driver menu for each application. The comparison with the Satellite (Core i5-3230M, Radeon HD 7610M) is a mixed bag. In theory, the F550DP should perform better in every benchmark. However, this is not the case. 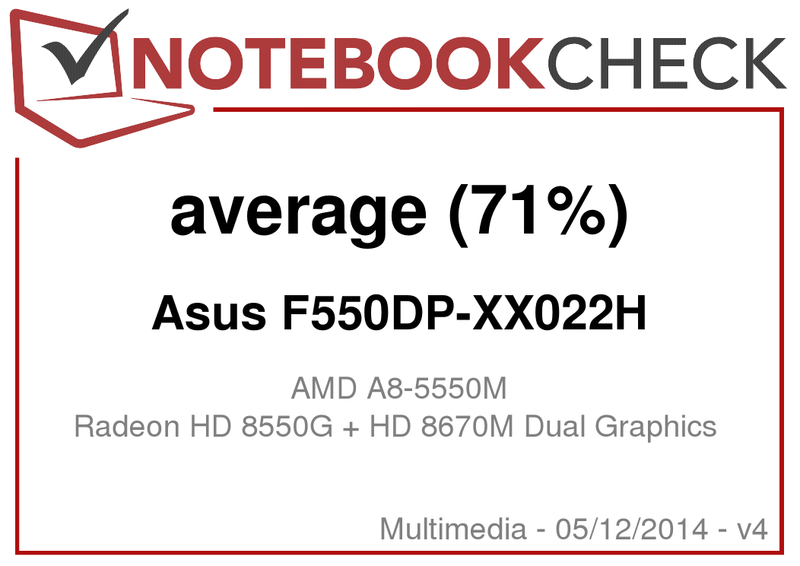 But, the Asus is significantly faster than the G505s (AMD A6-5350M, Radeon HD 8450G + Radeon HD 8570M Dual Graphics), as the F550DP features a nominally more powerful dual graphics solution. The F550DP can smoothly run several current computer games in standard resolution and medium graphics quality. As already mentioned above (see 3DMark benchmarks), the Asus notebook cannot achieve the full potential of its hardware in CPU-intensive games. Directly compared to the identically equipped HP Pavilion 15-e052sg (AMD A8-5550M, Radeon HD 8550G + Radeon HD 8670M), it performs partly better and partly worse. Those looking for a cheap, gaming capable notebook should consider the already mentioned HP Pavilion 15-e052sg. On average, its gaming performance is about on par with the F550DP's, but it only costs 450 Euros (~$610) and is even about 100 Euros (~$135) cheaper than the Asus. Acer's Aspire E1-572G (Core i5-4200U, Radeon HD 8750M) would be a further alternative. Its CPU and gaming performance is better than the Asus' and it is currently available for about 580 Euros (~$786). The notebook is audible while idle. The fan runs nearly always and the noise level is between 31.4 and 34.1 dB. The Satellite (32.2 to 34.2 dB) is about on par while the G505s (29.9 to 31.6 dB) performs better. Under medium load (3DMark06) and full load (stress test, Prime95 and Furmark) the noise level of the F550DP increases significantly to 40.8 and 43.6 dB respectively. The noise of the Satellite (40.9 and 40.4 dB) and especially the G505s (36.3 and 36.8 dB) is lower. Please note that the clock rate of the Lenovo varies greatly under load. The Asus F550DP-XX022H during the stress test. While idle, the case temperatures of all three computers are in the green. Under load, their temperatures increase moderately. All three notebooks exceed 40 °C close to the fan. In contrast, the palm rests remain relatively cool. Therefore, you can work with the notebooks without problems. During the stress test (Prime95 and Furmark run for at least one hour) the CPU clocks at 2.1 to 2.4 GHz on mains. But, the longer the test runs, the more seldom the clock rate increases to 2.4 GHz. Anyway, the clock rate never falls below 2.1 GHz. The dedicated GPU clocks at 975 MHz at the beginning of the stress test on mains. As the test progresses, it throttles to 400 MHz again and again. After about 15 to 20 minutes, the intervals with 400 MHz are longer than the intervals with full speed (975 MHz). After about 50 to 60 minutes the dedicated graphics card permanently clocks at 400 MHz. At the same time the clock rate of the CPU increases to 2.8 GHz. The integrated GPU primarily clocks at 351 MHz. Its clock rate is rarely increased. If the stress test runs on battery, the clock rates do not vary. The CPU runs at 2.1 GHz, the integrated GPU at 253 MHz and the dedicated graphics core at 400 MHz. We reran 3DMark06 immediately after the stress test. Apparently this was too much for the notebook: It shut down during the benchmark. Our measurements prove that performances losses are to be expected when the temperatures are high. The CPU temperature rose to up to 84 °C on mains. 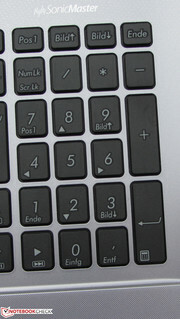 While idle, the power consumption is between 8.1 and 12.2 Watt, which is alright for a computer with these components. The Satellite (10.6 to 15.2 Watt) is slightly too power-hungry, while the G505s (6.6 to 10 Watt) is more frugal than the competitors. Under medium load (3DMark06) and full load (stress test, Prime95 and Furmark) the power consumption of the F550DP increases to 32.7 and 56.4 Watt respectively. So, it is on par with the Satellite (33.7 and 56.4 Watt). The G505s (37.7 and 41.7 Watt) requires less energy than the other two computers under full load. This might be due to the fact that its CPU clock rates vary greatly. While idle the Asus runs 6:32 h on a single charge. The G505s (8:26 h) lasts longer. The Satellite's battery life (4:43 h) is the shortest. We recorded the maximum runtime with the Battery Eater Reader's test with lowest display brightness, energy saving profile and disabled radio modules. 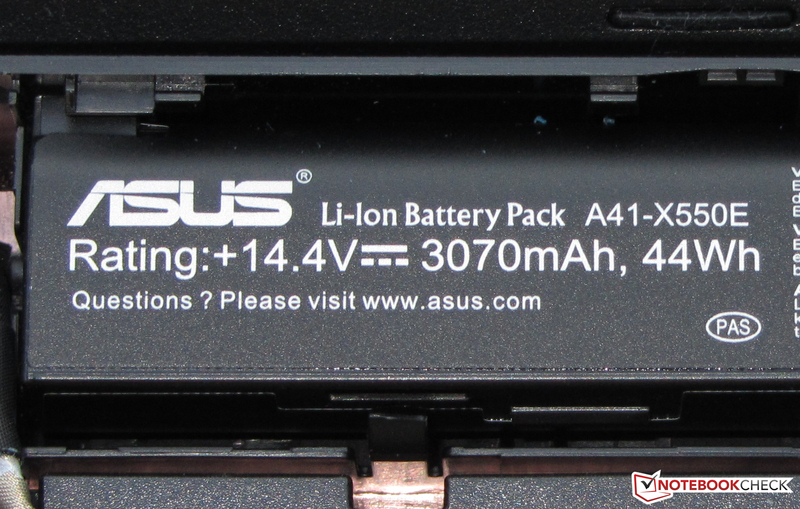 Under load the Asus achieves a battery life of 1:06 h. The Satellite (1:14 h) and the G505s (1:20 h) top the F550DP. The Battery Eater Classic test measured the load runtime with maximum display brightness, profile "maximum performance", and enabled radio modules. 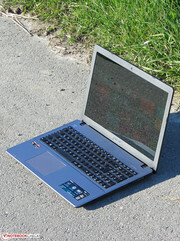 The F550DP finishes the Wi-Fi test in 3:16 h and again performs worse than the Satellite (3:21 h) and the G505s (3:36 h). During this test websites are automatically loaded in 40 second intervals. 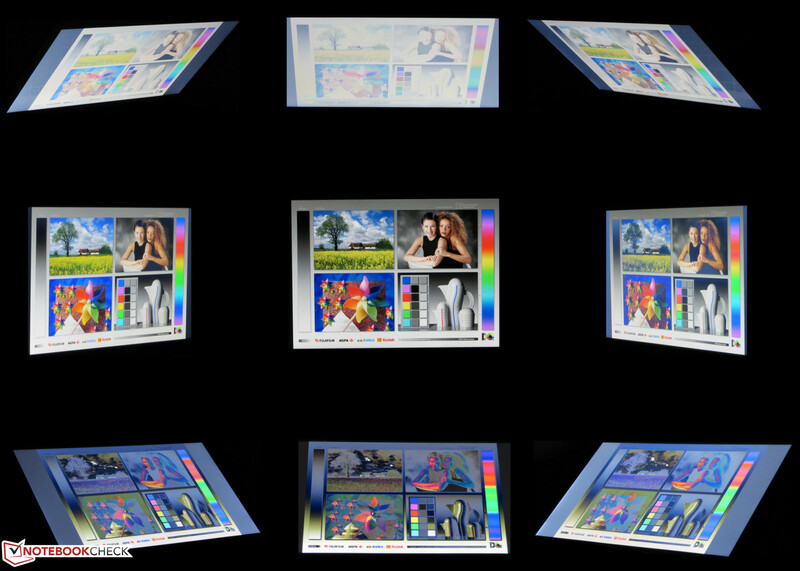 The energy saving profile is active and the display brightness is set to about 150 cd/m². DVD playback ends after 2:31 h and the F550DP comes in between the Satellite (2:01 h) and the G505s (3:15 h). The DVD test is run with energy saving profile (or higher if the DVD does not play smoothly), maximum display brightness and disabled radio modules. 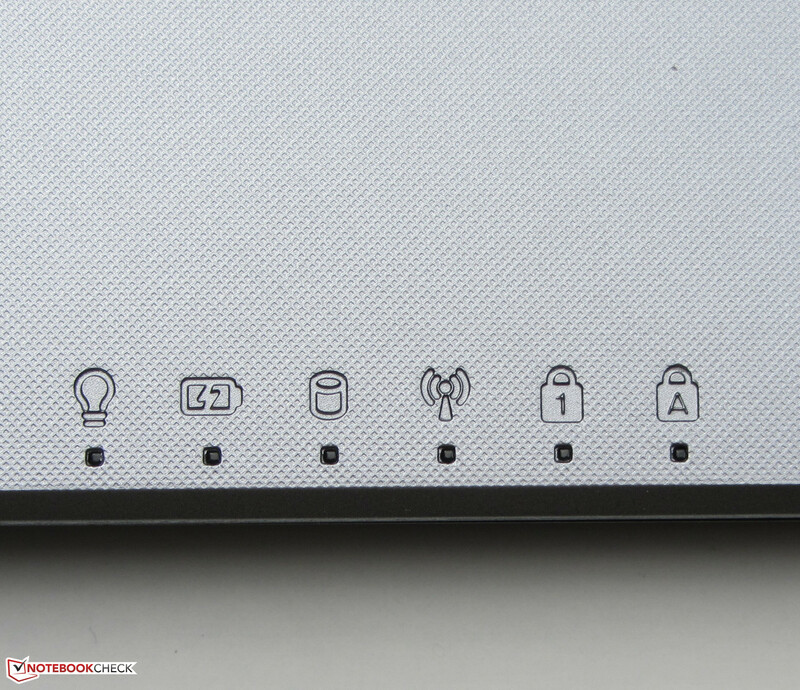 The battery capacities (Asus: 44 Wh, Toshiba: 48 Wh, Lenovo: 41 Wh) of the three notebook do not differ greatly. 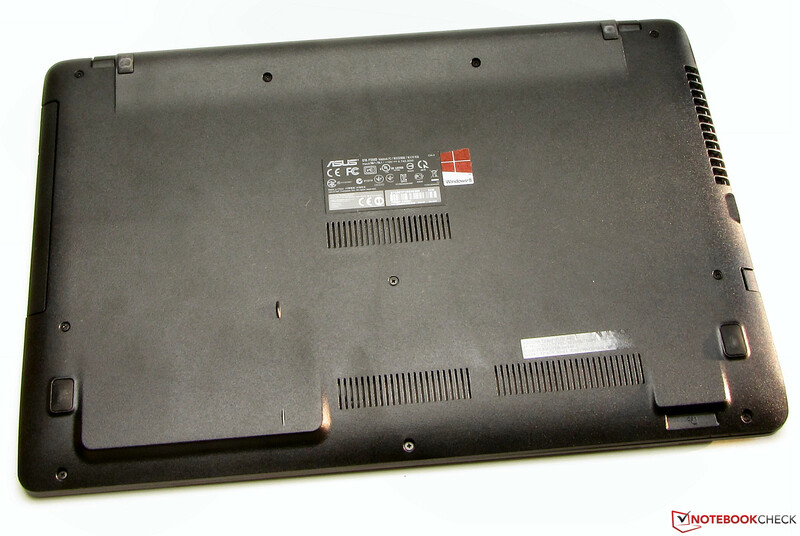 Therefore, the battery runtimes of the three notebooks can be compared to each other to some extent. 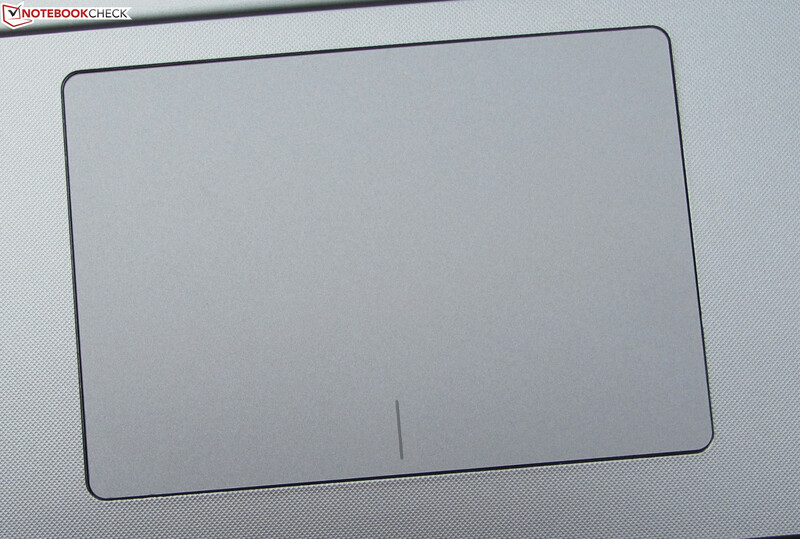 Overall, the F550DP's battery life is typical for a 15.6-inch notebook. The Asus F550DP delivers a decent system and gaming performance. In addition, it comes with a big storage capacity and a warranty of two years. The battery life is alright. But, there are also points of critique: The display is only modestly bright and its contrast is very low. Furthermore, the notebook cannot use its full potential: The CPU cannot use its maximum turbo clock in multi-threaded tasks. In addition, the system works sluggishly, but this might be a peculiarity of our test device. 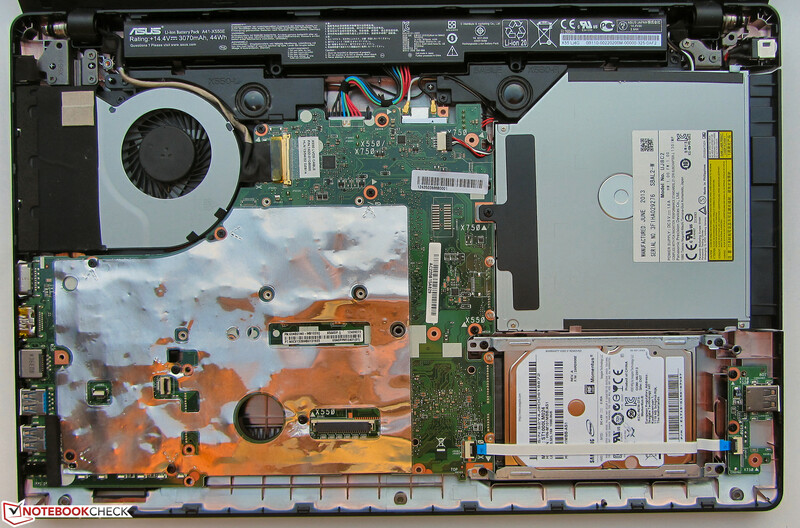 If more CPU performance is required, you should go for the Toshiba Satellite C855-2J4. Its Core i5 CPU is faster than the AMD counterpart. 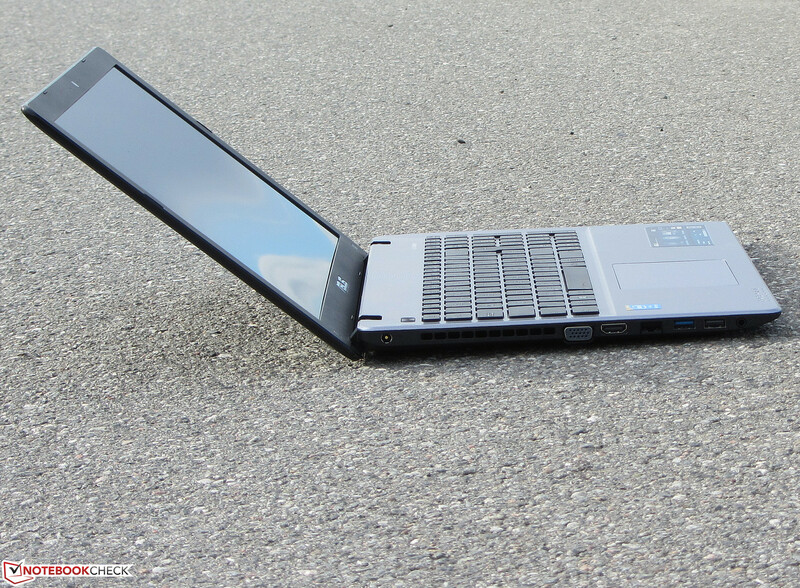 Lenovo's G505s is interesting if a notebook with low energy consumption that works as quiet as possible is needed. In addition, the G505s delivers the best battery life. The Wi-Fi module looks out from under the motherboard. 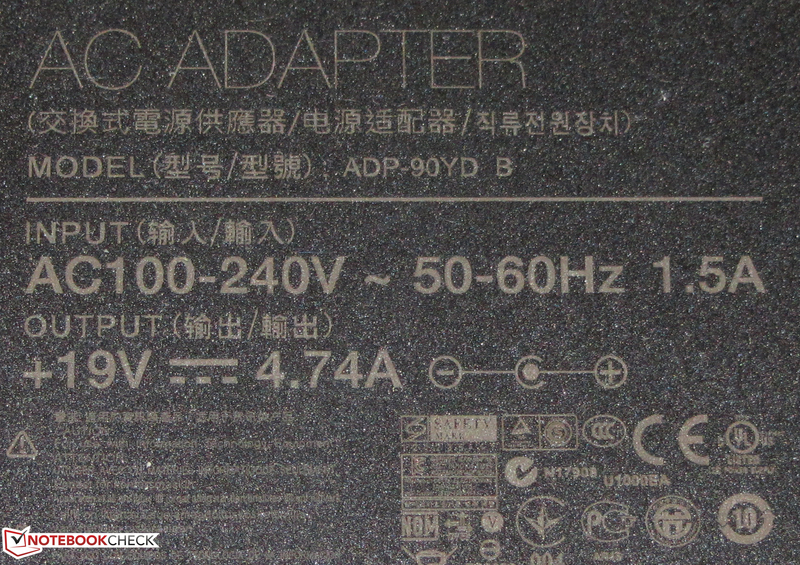 The battery is built-in, but it can be replaced if needed. It is connected to the motherboard with a plug. ... and delivers a maximum of 90 Watt. 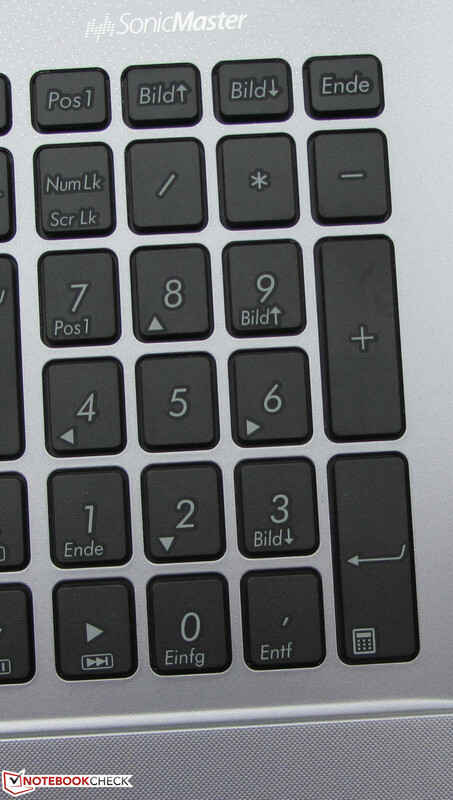 The keyboard is rather unsuitable for prolific writers. The clickpad is sufficiently big. This is proved by a look inside. ...and the palm rests feature different textures. Two years warranty and the good system and gaming performance. A contrast-rich display and a maintenance hatch. We would also appreciate a better keyboard. 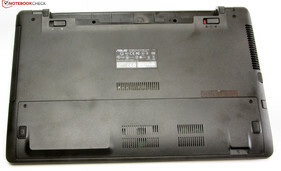 In contrast to the F550CA model, Asus did not unnecessarily integrate a maintenance hatch into the F550DP. 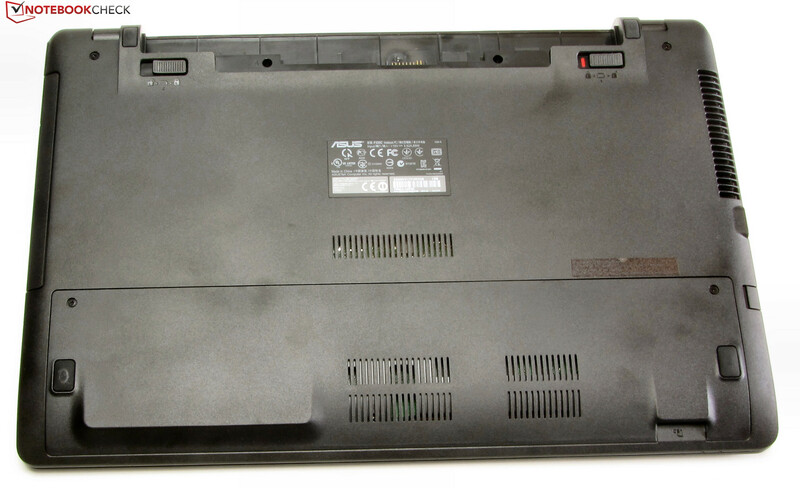 Toshiba Satellite C855-2J4, Lenovo G505s, HP Pavilion 15-e052sg, Acer Aspire E1-572G, Acer Aspire V5-573G, Dell Inspiron 15-3521-0620, HP Pavilion Sleekbook 15-b004sg, Packard Bell EasyNote TE11HC-32328G50Mnks, Asus A56CB-XX053H, HP Pavilion g6-2253sg, Acer Aspire E1-571G.